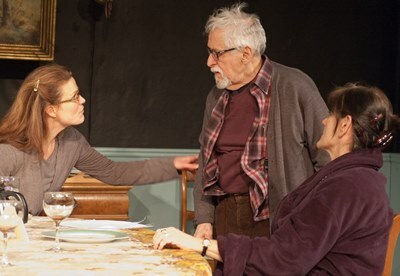 Review: “That Hopey Changey Thing” (★★) and “Sorry” (★★★★), two plays by Richard Nelson, at TimeLine Theatre through April 19. Family: the human comedy at its most hysterical. And I’m not talking about television sitcoms. 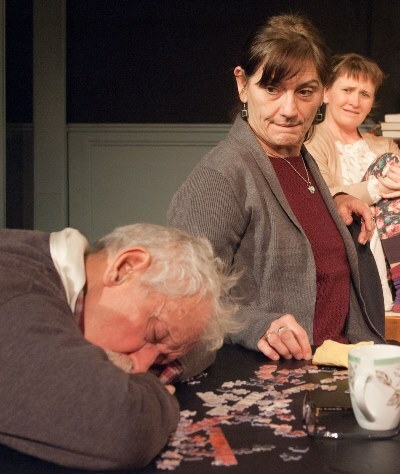 I mean the authentically bizarre brand of familial farce that resonates through Richard Nelson’s quartet of Apple family plays, two of which are now on contrasting display at TimeLine Theatre. Directed by Louis Contey, “That Hopey Changey Thing” and “Sorry” are the first and third in Nelson’s Apple series. 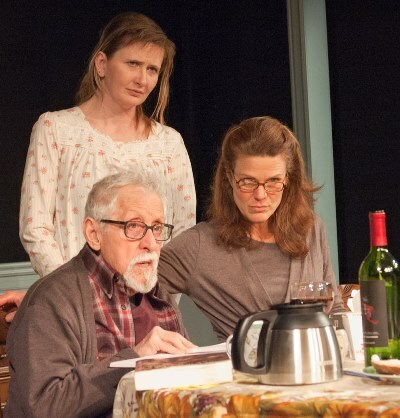 Each offers us a virtual chair at the table with four adult siblings and their elderly uncle as they confront family issues and stew over America’s political prospects in the time frame from November 2010 to November 2013. The sequence well might be characterized as four snapshots of American angst in the 21st century. Acknowledging that the political component puts the Apple plays on the cusp of immediate obsolescence, Nelson insists he has no problem with that. These are plays simply of and for our time, he says. While that may be true of “That Hopey Changey Thing” it doesn’t apply to “Sorry,” which is less concerned with the family’s conflicted liberalism and more focused on the timeless issue of what to do with an elderly relative whose descent into dementia has become unmanageable. Hence the one really LOL moment in the play – in this devoutly liberal upstate New York household — occurs when, after a pause in the dinner conversation, Richard, a lawyer who has committed the apostasy of taking a job in a Republican stronghold, blurts out: “Sarah Palin!” Two of his sisters drop their jaws, but a third actually pitches her pumpkin pie and ice cream onto the floor. Richard (David Parkes) actually has a point to make about Palin: Yes, she was not ready to be so near the presidency; but even before she showed her face, before most people even knew who she was, Democrats and the press were at her throat. It was more than unfair, he says. It was shameful. His sisters – Barbara, the eldest, a high school English teacher (Janet Ulrich Brooks); Marian, an elementary teacher (Juliet Hart), and Jane, a non-fiction writer (Mechelle Moe) – can only mutter vague responses. Indeed, one sensed in the audience a ringing quiet. Score one for playwright Nelson for an ethical truth that transcends the fleeting instant of a former governor of Alaska. But “That Hopey Changey Thing” gets bogged down in its roundtable of political dithering. It becomes a high-minded slog, wordy and circular, in retrospect a blur. It might have been group play-acting in a some college course on social psychology – were it not for Uncle Benjamin. 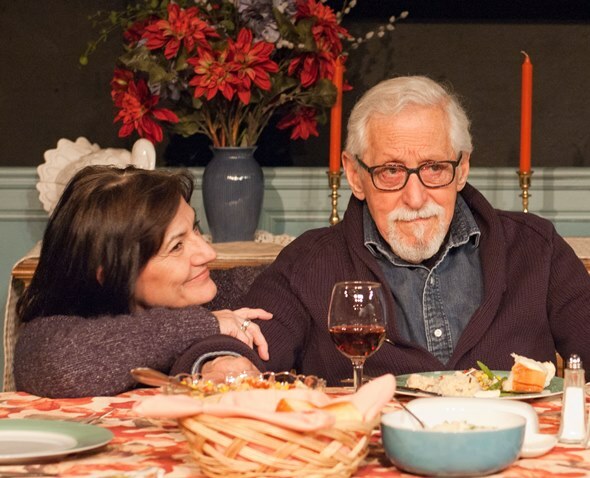 Benjamin (in a mesmerizing turn by Mike Nussbaum), was once a prominent film and stage actor and is now quite elderly. He has slipped into dementia after a heart attack. Though he enjoys moments of clarity, mostly he lives in a fog of disconnection. Whenever Nussbaum’s half-aware but still-radiant old man speaks, whether about the old days or in the ephemeral light of his present understanding, “That Hopey Changey Thing” becomes suddenly, urgently relevant again. It is the central place of Uncle Benjamin that raises the other play, aptly titled “Sorry,” to a higher plane. On the eve of mid-term elections, two years later, Benjamin’s dementia has worsened to the point where Richard and his sisters have decided reluctantly to place him in a home for specialized care. Very reluctantly in the case of Barbara, with whom he lives. As the siblings gather at her home, before sun-up on the morning of election day, the conversation drifts from concerns over that outcome to their resolve – maybe not so firm after all – to relocate Benjamin. Parkes, as Richard, along with Hart and Moe as Marian and Jane, bring credible discomfort and cross purposes to their agony over this thing they’re convinced has to be done. But Brooks’ protective, guilt-ridden Barbara and Nussbaum’s Benjamin, oblivious one moment and raging the next, take the play to a heart-breaking place. He frustrates her, this fragile man whom she knew in his theatrical greatness, and lately he has begun to display inappropriate behavior, toward Barbara and toward female visitors. Still, how can she consign him to the perdition of a “home” that will deprive him of all sense of familiarity, comfort and belonging? Sorrow rules the breakfast table. They are all sorry – sorry as they misspeak and misstep, sorry for the anguish this is costing Barbara, sorry for this poor old man. Yet what must be, shall be. If only one might, with clear sight, determine what that is. It is a thousand-piece puzzle. Like the one Barbara and Benjamin, in quiet togetherness, are working on as the morning light spreads.